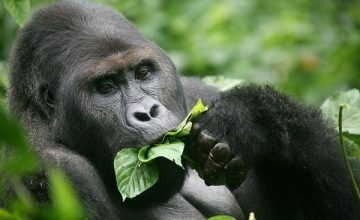 10 Days Primate Safari in Uganda Rwanda Congo starts in Uganda’s capital Kampala and ends in Rwanda’s Kigali. 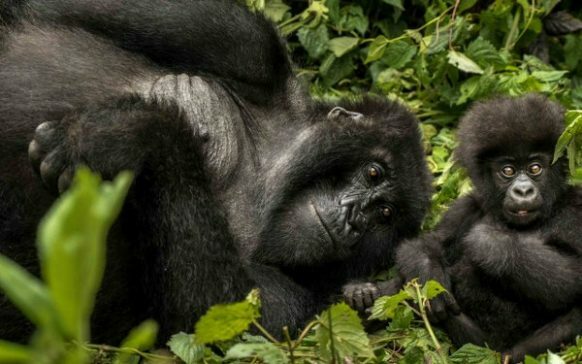 It is an exciting safari package involving Chimpanzee trekking in Kibale National Park, Mountain Gorilla Trekking in Bwindi Impenetrable National Park and Volcanoes National Park, Eastern Lowland Gorilla Trekking in Kahuzi Biega National Park, Golden Monkey tracking in Mgahinga Gorilla National Park, extensive game viewing experience in Queen Elizabeth National Park with possibilities of viewing tree climbing lions along with other wild game. Embark on the drive to Fort Portal Area 300km approximately 5 hours drive from Kampala after breakfast at your place of stay. You enjoy the views of the countryside marked by unique features like Mubende Inselbergs, Lake Wamara and the lush tea estates near Fort Portal. You arrive in Fort Portal town for lunch after which you connect to Amabere g’Nnyinamwiru caves where the breast-like features are believed to be breasts of Nnyinamwiru a daughter of Bukuku – the self enthroned King of the Bachwezi who is noted to have denied the daughter to breastfeed her son as he had been foretold that the grandson would take over his throne. The seasonal Nyakasura River flows over the caves forming beautiful falls and sightseeing experience. 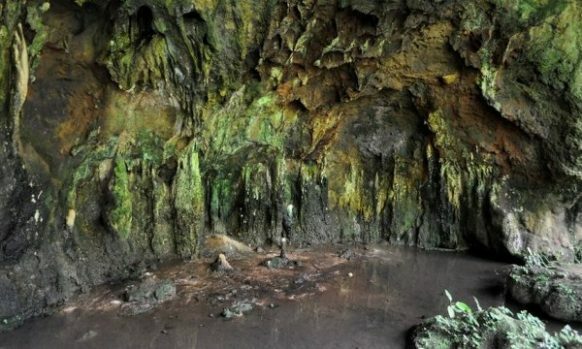 From the caves, you embark on the hike to the Crater field enjoying the views of the explosion hollows and lakes not forgetting the Rwenzori Mountains at a distance. Hiking the Kyeganywa Hill is also thrilling. 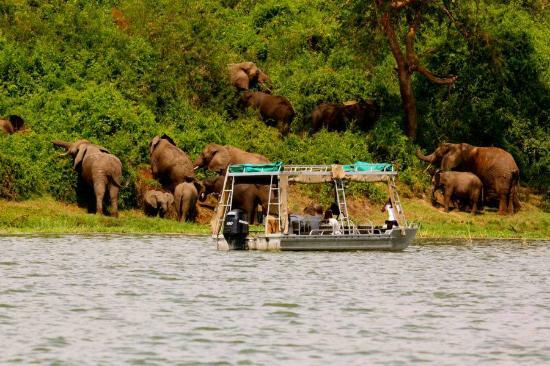 Retreat from the activity & connect to Kibale National Park for relaxation, dinner and overnight. 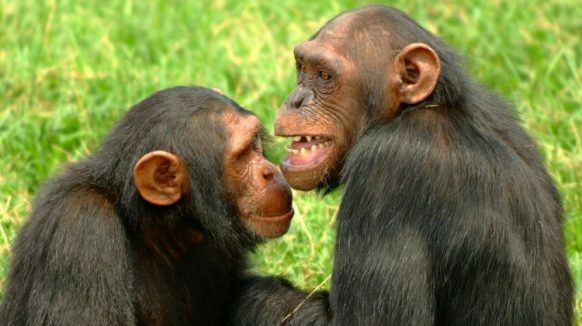 Congregate at Kibale’s Kanyanchu Tourism Center at 6am to catch up with others and eventual set off to the forest at 6:30am for a whole day Chimpanzee Habituation experience. 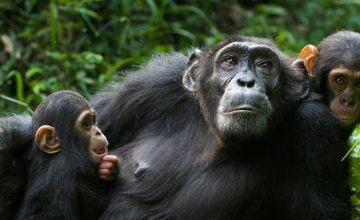 You have the opportunity to catch up with the chimpanzees as they set out from their nests and spend a great deal of time with them as they forage, munch fruit, hunt, copulate, patrol, make pant hoot calls along with other exciting behaviors. You break from the Habituation experience at 4pm and set off for the 3 hours transfer 157km to Queen Elizabeth National Park. The en route scenic views of Rwenzori Mountains are also rewarding. You start off the early morning game drive at 7am in the Kasenyi sector gaining likely chances of viewing Lions, Buffalos, Elephants, Deffassa Waterbuck, Side-striped jackal, Leopard, Warthogs, Uganda Kobs, Topis, Oribis, Spotted Hyenas among others. 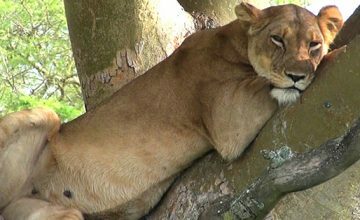 The game viewing activity in your 4 x 4 Safari Van / Land cruiser with a pop up roof takes around 3 – 4 hours after which you connect to Mweya peninsular for relaxation and lunch. In the afternoon, you assemble at Mweya jetty for 2pm boat cruise along the 45km long Kazinga Channel that adjoins Lakes George and Edward. The ride takes 2 hours and offers likely views of Nile crocodiles, Hippos, birds like Africa skimmers, Great Cormorants among others. The drive along the channel track offers late evening game viewing experience. 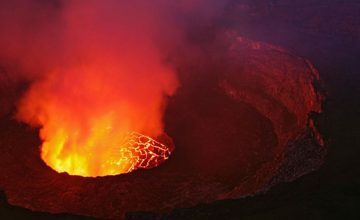 Following breakfast, you set off on the drive to Bukavu – the South Kivu Province in Democratic Republic of Congo enjoying the en route views of Lake Kivu and the Congo Nile divide trail. Cross the border post at Cyangungu and spend the evening in Bukavu where the Kahuzi Biega National Park is positioned. Set off on the drive back to Kigali City after breakfast passing through the lush forested landscapes of Nyungwe Forest National Park making a stop in Butare to visit the National Museum of Rwanda with 100,000 artefacts detailing the history and heritage of Rwanda. Another stop can be made at Nyanza Palace – the former headquarters of the Rwandan monarchy and home to the two former Kings of Rwandan namely Musinga and his successor Rudahigwa. Proceed on the drive to Kigali to mark the end of the safari.